I know viruses, Trojans and malware are all bad, but I really can’t tell what they all do. What the heck is the difference anyways? While we are at it, someone told me these don’t exist on Mac computers, is that true? Let’s start with the easiest to explain bad guy. Malware is short for ‘malicious software’ and is basically a term for viruses, worms, or anything that wants to cause havoc or steal information on your computer. A virus is a program that copies and infects a file, before copying onto the next in an attempt to take over the whole computer. 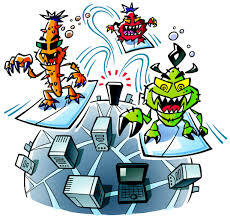 Once it has one computer infected, it moves onto the next through the sharing of infected files, like a cold virus. Spyware collects personal information without your knowledge through a program, and sends the information back the creator for them to use as they like. The creator could want this information for any reason from collecting your passwords and credit card numbers, to just wanting to add annoying toolbars to your internet browser. Though the goal here isn’t to completely kill your computer, once you have one spyware software, you usually have quite a few, so it will slow your computer right down. Scareware is a relatively new kind of attack on your computer. It pretends that it is a kind of antivirus software, but once you download it, it informs you that it has all of your files for ransom, or that there are hundreds of viruses on your computer and they cannot be removed until you pay for the “full licence”. A Trojan horse does exactly the same thing as what it was named after. It is made to look innocent, so when users download it, for the most part, they don’t know until it’s too late. Most of the time, Trojans create a kind of back door, so someone else can remotely control your computer. The computer can then be used for all sorts of things. Computer worms send copies of themselves to other PCs, usually using security holes to travel from one host to the next. They are very easily spread through a network, and infect every PC in their path. They can do things such as reboot your computer repeatedly, or crash websites. For all those Mac users that are feeling smug and safe…there are viruses, etc for Mac. However, because of the fact that more people have PCs, most viruses are targeted towards PCs rather than Macs. Got a question? Email it to: geek@tbyd.ca.